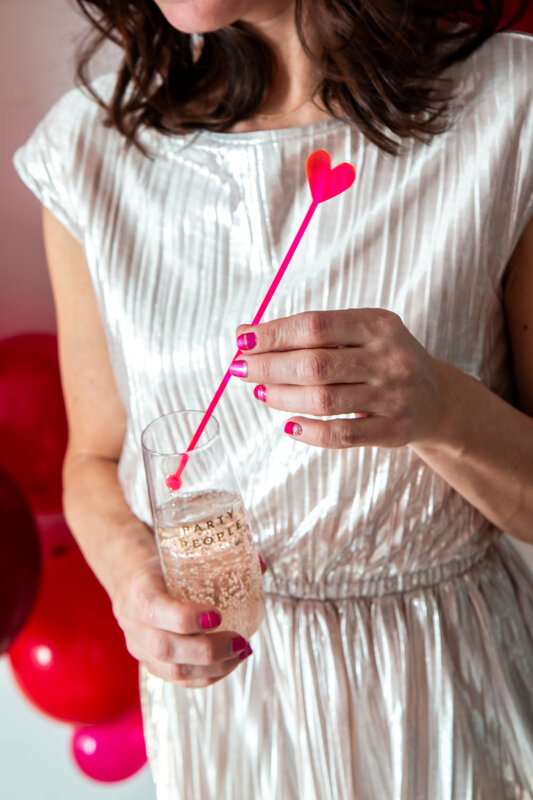 Once February kicks off, we’re always in the mood to celebrate love- whether that’s with our gal pals, our favorite work team members, our sisters, or our significant others. 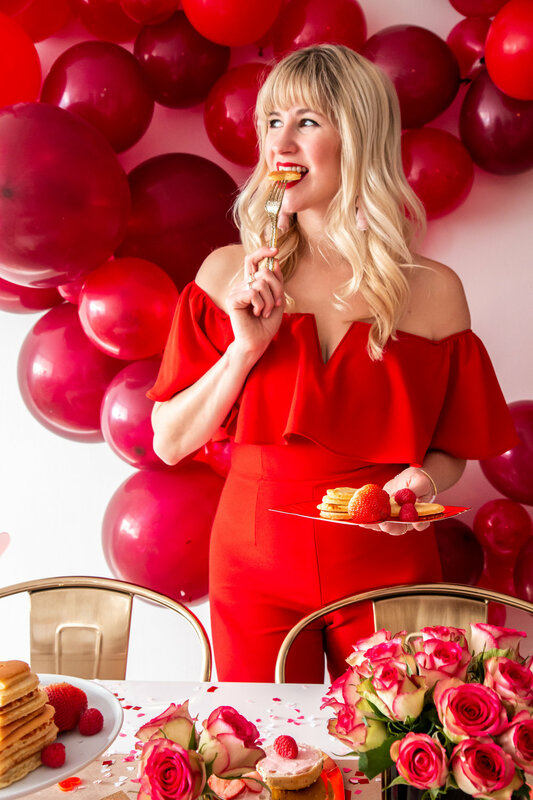 Basically, we’re just looking for any excuse to throw a party and the idea of celebrating LOVE sounds like a pretty good one. 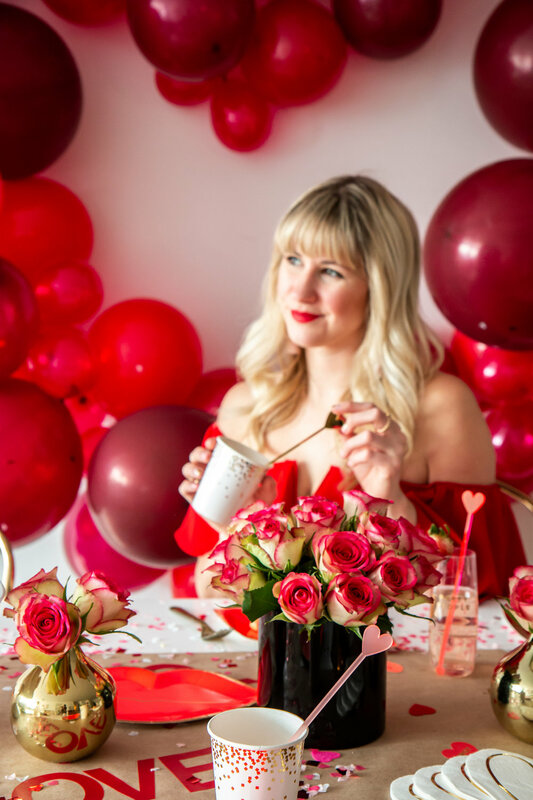 As a way to celebrate Valentine’s Day with the LMP squad (aka some of my favorite galentines), I pulled out our Little Miss Valentine’s Day Party in a Box (which is now ON SALE! ), Kraft paper, some red and pink decor and got to work. I wanted to come up with some special ways to glam up the office aside from just tableware, so I decided to go all out making a heart balloon garland to hang on the wall. It made such an impact and immediately transformed the room. Next, I rolled out the kraft paper and began to decorate it so it could act as a runner for our table. 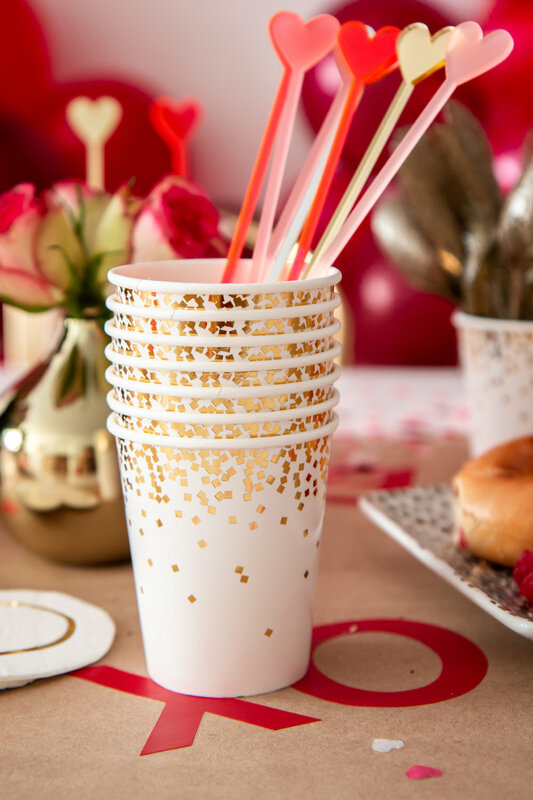 By simply adding red letter stickers and little hearts, the table was immediately in line with the theme. I added some simple roses, cake stands and trays, before setting off to fill the table with treats. What better surprise to arrive at the office in the morning to a stack of fresh pancakes?! Especially if they’re shaped like hearts. Pro tip: just use a heart cookie cutter! I made huge pancakes so I would have enough room to cut a few hearts out of each. We also added red berries and bagels with pink cream cheese! They looked gorgeous and tasted amazing. The girls and I enjoyed our brunch, sipped on sweet rosé, and reminded each other why we’re so lucky to have galentines who we also can work with on a daily basis. It’s so important to have gal pals who stick together and who are there to encourage success: and that’s exactly why we’re a powerful dream team! Enjoy the next week celebrating all the LOVE in your life, and don’t forget to do something special for all those who deserve it.